Rod Gould, former city manager of Sta. 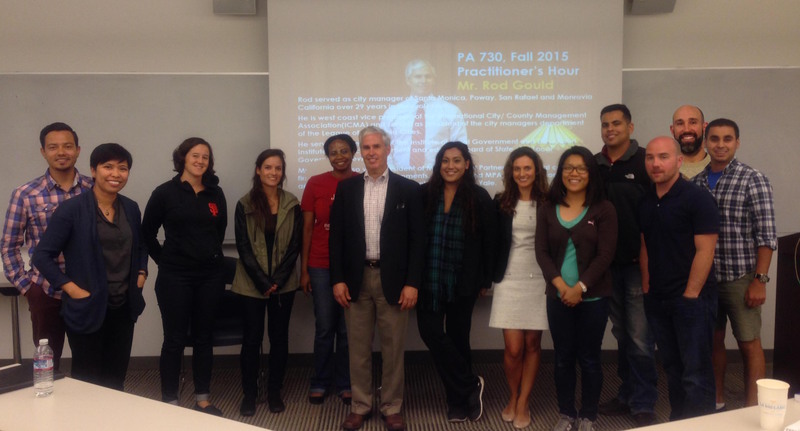 Monica, Poway, San Rafael and Monrovia visited the SF State Budgeting class (PA 730) of Dr. Ernie Joaquin on September 4, 2015 and shared his insights in budget leadership and financial management. Gould is West Coast Vice President of the International City/ County Management Associating (ICMA) and served as President of the City Managers Department of the League of California Cities. “Thank you for the chance to speak. You have a fine class of students,” Gould said after the talk.